As part of my half-marathon training plan, I'm supposed to cross train at least once a week. At present, my cross-training consists of me joining Holly for her mother and baby swimming lesson for half an hour every week! Once my first half marathon is out of the way, later this month, I have made a promise to myself that I will go swimming, for myself, once every week and so Swimshop got in contact to ask me to try out one of their items of swimwear as part of my new training regime. 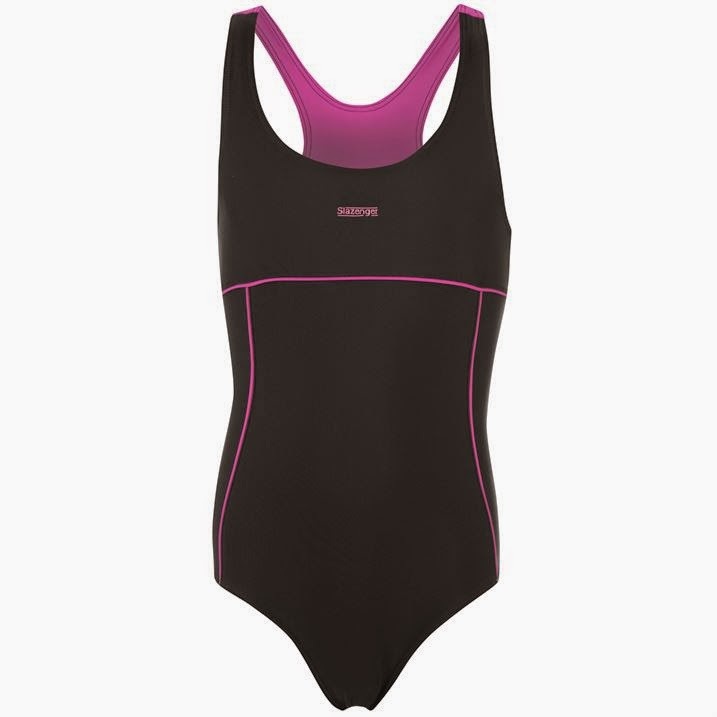 You know me, I'm not one to go with plain colours or something subtle so I chose this Speedo Women's endurance muscleback swimmng costume which comes in a set of colours that they call adriatic blue, papaya yellow and ecstatic pink! Despite being colourful and fun, it is actually a dedicated sports suit which can withstand speed and is designed to be resistant to damage from chlorine (something that my swimwear always succumbs to, sooner or later). I love this suit although I would say that I always struggle with Speedo costumes as a tall woman... it is phenomenally hard to find swimwear which has a long enough body shape. I paired my new costume with a brand new pair of goggles - the Keifer Raptors. I was sorely in need of a new pair of goggles having discovered that it was so long since I had last been swimming that my old pair had perished! Woops. Oh well, I'm back in the zone now and I'm really looking forward to adding a new dimension to my training. Swimming is an entirely different discipline to running. But it isn't just Mummy who gets to go swimming regularly now. Lara, who is nearly 6, is also swimming at least once a week, sometimes more. Despite a wobble at the start of the new term, Lara is now LOVING her swimming lessons and I am so proud when I see her swimming breast stroke and butterfly confidently in the pool. Lara is now sporting one of these very grown-up looking Slazenger Girls Racerback swimming costumes from Swimshop which start at age 7 and cost from just £4.49. When I see her swim, I can't quite believe how grown up she looks. She is my little swimming superstar.